Marc Robinson Jewelers is proud to be an official RADO dealer. For nearly three decades Rado has been crafting high-tech ceramic works of art and craftsmanship. 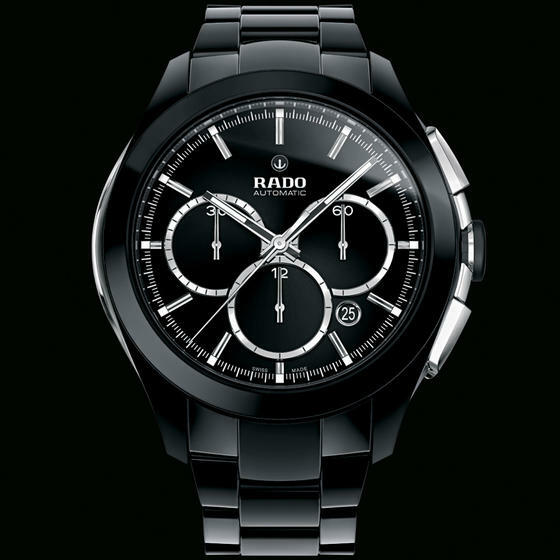 Rado watches have a smooth, stylish finish available in metallic or matte and an ever-expanding array of colors. All of these brilliant timepieces feature a gentle approach to glamour: lightweight and hypoallergenic, high-tech ceramic watches that can be worn by anyone with sensitive skin. RADO is a globally recognized brand, famous for innovative design and its use of revolutionary materials to create some of the world’s most beautiful and durable luxury timepieces. Since its founding in Lengnau, Switzerland, RADO has been a pioneer in the watch industry. The company can trace it’s humble beginnings back to 1917, and their philosophy “If we can imagine it, we can make it” still holds true today. 2011 saw the advent of Rado‘s ultra-slim ceramic masterpiece: the True Thinline, which measures in at an unbelievable 5 mm. In 2012 the sporty-chic HyperChrome built on the True Thinline’s case technology, doing away with the previously required stainless steel “core” in favor of a sleek monobloc case. The company broke new ground in touch technology with the Esenza Touch (2013), a “crownless wonder” that can be set with a simple touch and swipe, and the HyperChrome Dual Timer (2014), a clever travel timepiece with a touch-controlled time zone swap function. In 2015 the chocolate brown high-tech ceramic was unveiled, a stylish addition to the high-tech ceramic color palette.